At Haoshi carbon fiber Co.,Ltd , we produce all of our own carbon and graphite thermal insulation materials under the strictest quality standards. If you have any interested in carbon felt, graphite felt, rigid graphite board, vacuum thermal chamber, Hot Zone and CFC for Vacuum Furnace, High Temperature Sintering Furnace, Solar Silicon Furnace, crystal growth furnace, inert atmosphere furnaces, semiconductor furnace, multicrystalline DSS, Directional Solidification System(DSS) furnaces...... please tell me, you can be sure that we will do everything in our power to merit your business. We value your business and welcome to China visit our factories. Producing graphite felt, rigid graphite board and CFC, Heat Insulation Materials Using in Vacuum Furnace, inert atmosphere furnaces, crystal growth furnace, multicrystalline DSS, single crystal furnace, High Temperature Sintering Furnace, and much more Thermal Insulation Products for heat insulating. Gansu HaoShi Carbon Fiber Co., Ltd.(HSCF) is the leading manufacturer of PAN-based Carbon Fiber in China, HSCF began to research and industrialize in 1988. From our five modern production plants in Central GANSU Province, CHINA, there have the China's largest high-temperature Vacuum Furnaces and entire process of production using computer-controlled temperature. The main products include premium high purity Carbon Fiber based of Carbon fiber board, rigid graphite board, graphite felt, graphite insulation cylinders, and carbon-carbon composites (CFC). 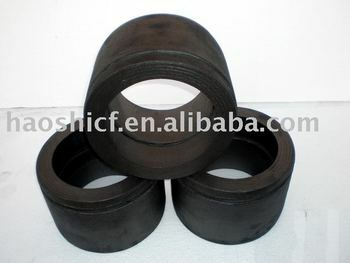 Mainly used as insulation in high-vacuum and inert atmosphere furnaces. This kind of high-vacuum is widely used for metal heat treatment, meticulous and ceramic sintering, different kinds of crystallization production, sintering monocrystalline silicon for semiconductors. Since these furnaces work at extremely high temperatures, it is necessary to have insulation material that can withstand such high temperatures. Moreover, for energy conserving purposes, quality heat insulation material is the best choice. We pride ourselves in the ability to offer first class technical backup to our customer base, and over the years we have developed close technical partnerships with major fields including Aerospace, Semiconductor, Solar Ingots, Specialist Castings, Metal Composites, Crystal Growing, Hard Metal Sintering, and the Heat Treat Sectors. HSCF can also research and develop new carbon materials (including composite materials) for special uses according to clients' demands. Commercial Heat Treat Furnaces, Hardening, Tempering, etc.